The director of the Syrian Foreign Ministry's Foreign Press Department yesterday expressed disappointment with the outcome of the Arab-Israeli peace conference held in Annapolis, Maryland, in late November. Syria had sent its deputy foreign minister, Faisal Mikdad, to participate in the conference. But the Foreign Press department head, Ms. Bushra Kanafani, told me in an exclusive interview yesterday that she was not sure where the process launched at Annapolis was now headed. Ms. Kanafani expressed pessimism that the Palestinian-Israeli negotiating track that was re-launched there was headed for success. "As we see it" she said, "the priority for Palestinians is not in these peace talks but to make a reconciliation among the Palestinians themselves." At the time of Annapolis, Syria had scrapped plans to host a "summit conference" involving Hamas and many other anti-Fateh Palestinian movements. That conference has now been rescheduled for January 23-25. Ms. Kanafani was at pains to point out, though, that "its aim is to rebuild Palestinian national unity… Mr. Abbas has been invited." 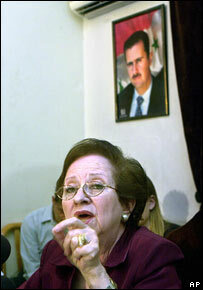 Regarding the Syrian-Israeli track, she expressed no expectation that anything would be happening in it any time soon. A follow-up session that the Russians– who are members of the US-led "Quartet", along with the UN and the EU– had considered holding in Moscow in mid-January has not eventualized, and there are no other current prospects for any activity on the Syrian-Israeli track. …. Syria astonished over Bush's statements on Palestinian right of return "According to the international law, the American president doesn't have a right to annul an international resolution that guarantees and preserves the right of return of the Palestinian refugees," SANA quoted a Foreign Ministry official as saying. The Palestinian right of return was stipulated in UN Resolution194, which was adopted in 1948 and calls for the return of the Palestinian refugees and compensation paid to those who choose not to go back. Syria's economy had a good year and seemed to show that being the subject of US sanctions was not a major impediment to growth and investment. The attack on a US embassy vehicle on 15 January that killed three Lebanese represents a dangerous expansion of political violence in the country to include international targets, and shows that al-Qaeda-inspired extremists are attempting to push the politically deadlocked country towards civil war, said analysts. Saad Ghorayeb compared the 15 January attack with the latest attack on UNIFIL. “Both were very clumsily planned and were not high value targets. It was an assassination attempt, but not along the lines of previous assassinations,” she said, referring to a string of assassinations of anti-Syrian figures in Lebanon since the 2005 assassination of former Premier Rafik Hariri. The atimes piece below also deflates the latest US navy Iranin Speedboat incident. Yesterday I watched Frontline on PBS as it showed the strategy and the methods used by the VP in enhancing the power of the executive branch to an unprecedented level and shows how the Justice Department chief Gonzales was all set to allow for the President to sign an order in lieu of John Aschcroft to allow continued NSA monitoring of US citizens without court oversight. It showed that if that were to happen at least 30 top Justice Department officials of the highest level were ready to resign on the spot creating a major scandal. Nevertheless, the office of the VP managed to sneak back the provisions one by one into day to day operations until the Congress passed into Democratic hands in 2006. This story is illustrative of the relentless and incredible Machiavellic machinations of the VP to get his agenda implemented and therefore, I believe that with regard to the ME, we may very well see an Israeli provocation or attack followed by an Iranian response and then US intervention. In an election year, looking like you are about to abandon poor helpless little Israel to the Iranina monster will ensure full support of the Congress and the candidates. “our current system of governance suffers from a lack of accountability and a near-total absence of measurability”.